Note: The term Copy Blogger used in this post does not refer to www.copyblogger.com as a blog rather it refers to a blogger that steals articles. Every average blogger writing daily articles, always have two things in mind – Get traffic and get paid!. But unfortunately copy bloggers never get traffic neither do they get paid. Humans are like search engine crawlers, very sensitive to words and repetitions. Once a human visit your blog and find two or more copied articles, they simply move on to the next blog. So do search engine crawlers. If they find copied contents they just ignore your blog from indexing. What Makes You A Copy Blogger? 5 Reasons Why Copy Bloggers Never Get Paid and Indexed. 3. Poor Traffic And Page Views. 4. Ineffective Marketing Strategy and Lost of Passion. 5. No Sponsorship And Banner Placement. How To Get Paid As A Blogger. 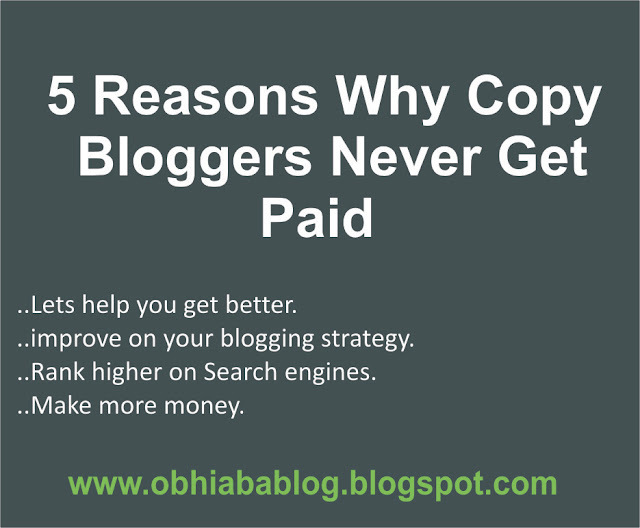 Previously Asked Questions on 5 Reasons Why Copy Bloggers Never Get Paid. Does Copy Blogging Affect a Blogger’s Career? Is it good to share Other Bloggers Content? Aside from posting daily, as a professional blogger, the quality of your content matters most. Copy bloggers don’t seem to know this and you become one by simply writing a clone of another person work without giving due credits to the original writer. Though post-credits don’t really mean you did not copy, it helps to prevent you being penalized because credits act as an acknowledgment of the original content. Recommended: Best Blogging Platforms For Beginners. Blogging is fun for committed bloggers. So why don’t you make it fun for yourself? Note: Don’t force yourself into blogging. Make it a hobby and writing contents daily would be really easy for you. – Start a blog with Blogger.com today. Unlike football where you can simply skill out a leg over without getting penalized, blogging is entirely different. Daily, bloggers get penalized by Google, Bing, Yahoo, Yandex and Adsense for being a copy blogger. I have carefully read various SEO articles on blogs and I found the top 5 reasons why copy bloggers never get paid. Search Engine Optimization is the second most practiced way of dragging traffic to your blog. First, of course, is social media. Articles we write are not only read by humans, they are also read by search engine crawlers. Unlike humans hat finds it hard to identify copied contents, search engines crawl the entire post and if found guilty of copy blogging, they simply ignore your post from indexing. Major sites like Wikipedia are never a victim of being a copy blogger because they are known by search engines to write only first-hand posts. This is why they rank higher in Google search. Google covers nearly 60% of traffic entering well SEO optimized sites including MyBloggerTricks, Helplogger, OgbongeBlog – All these are sites that always rank high in search engine results. If you are a copy blogger and still your site is not yet disproved by Adsense, then wait for it cause it will come like a train stopping at a train station. New site owners who get involved in fake contents always suffer from being approved by Adsense. Affiliate programs never approve copy bloggers including Jumia Affiliates. Adsense is Google owned Affiliate program that most bloggers rely on for getting paid. Top richest bloggers in Nigeria – Linda Ikeji, BellaNaija, run Adsense on their sites for income. The trick about Adsense is simple – The higher your blog visitors the higher the probability of readers clicking ads and the more they click, the more you earn money. So let’s analyze a blog with 10,000 views a day, and 100 ad clicks a day, – you see in a month the owner gets over a thousand dollars. Recommended: How to set the number of posts shown on label pages. Just like Google, Adsense uses crawlers to view your site and if you are found a copy blogger, adsence instantly disapproves your blog. Who will read an article already seen/read over a hundred times?. Aside from impressing search engines, you need to impress your daily viewers with new and original contents. If not you lose your passion for blogging. Copy bloggers lose the privilege of active readers and followers. A brand new Ferrari is better than an old wagon. Copy Bloggers visit other blogs on their niche and steal articles without referral credits/links. This is an offense in blogging and if found guilty your visitors will definitely go for the original article. This is bad for blog traffic and page views. Copy bloggers never get the opportunity of marketing their post on social media and Adwords. It is difficult to market a stolen material in the internet sales. No reader will be interested in clicking on your links neither will they share. The headline of your article becomes noneffective after being used by other bloggers. What is the power of marketing? – Headings. This is why bloggers should use headings/headlines that are unique and stop copying what other bloggers published. Passion for whatever one does is the key to success. Bloggers never get paid until they love what they do but how can you love blogging if all you do is copy?. This is why copy bloggers never get recognized as iconic writers. On this one is will be referring to Linda Ikeji and Bella Naija. Visit both blogs and spot the plentiful placement of banners everywhere. This is only because they are no copy bloggers. No advertiser would want to place adverts on websites that publish copied contents. This is why most young bloggers lose sponsorship from companies. Copying is bad for your blog and avoiding it will be an extreme increase in your traffic and visitors. In other to get paid as a blogger, you have to understand the above listed 5 reasons why copy bloggers don’t get paid and learn to implement them in all your posts. Recommended: Download Blogus Responsive & SEO Ready Blogger Template. On a review on the biggest blogs e.g. Real Madrid Vs, Wolfsburg was posted by TheGuardian and also by DailyMail, I found out that having similar contents is no copy blogging. This tells us to always edit and add more juicy ideas, tips etc to whatever topic we find interesting on other blogs. This will help us rank higher and give better solutions to readers. This question has been asked on various blogs and I have finally seen it important to give a better explanation. Yes, it does affect a blogger’s career. Reasons be that copy blogger can never be better than the blogger he copies from thereby reducing his blogging career to pure stealing. Copy bloggers are losers. Yes, sharing other bloggers content is very good for your blog because of a few reasons which I will explain in another blog post. 5 reasons why copy bloggers never get paid as an inspiration from the blogging world. I have seen a lot of young bloggers wasting their time copying articles instead of writing theirs. Linda Ikeji is most favoured today as a blogger because of the numerous bloggers stealing her contents thereby improving her SEO and blessing her with views. Should in case you have more questions related to this post or any other post on this blog. Do leave your questions below and if you have my juicy ideas to add to this post feel free to share it below in the comment box. Loved my post? please share.